Last year Jesse Green wrote a wonderfully insightful cover story for New York Magazine called “S/He” about the parents of young, transgender children. For the past 12 months I’ve been telling anyone who will listen that they must read this article, as it sheds light on a fascinating, little-discussed topic. Liberal parents, after all, are quick to say they don’t care if their child grows up to be gay, but what happens if their son or daughter shows gender variant behavior? How comfortable are these same, liberal parents with the possibility of having a transgender child? 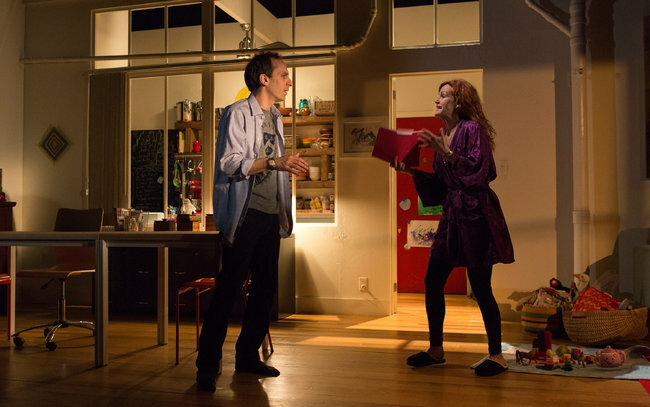 Daniel Pearle’s excellent, thought-provoking new drama A Kid Like Jake, now playing at Lincoln Center Theater, attacks the same subject matter, ingeniously setting it in the context of anxious New York parents trying to get their four year-old into a competitive private school. To Alex and Greg, getting their son into a good private school is everything, and they are willing to go through hell and subject him, and themselves, to unbelievable scrutiny in order to achieve this goal. Through the process, however, they are forced to confront the fact that their smart, sensitive son, who loves Cinderella and dressing up as female fairy tale characters, is “special” in a way they are not quite ready to confront. Pearle has done something nearly miraculous — he’s taken a complicated topic, loaded with personal and political implications, and crafted smart, human drama around it. It’s not a perfect play — a dream sequence toward the end doesn’t really land — but the sharp, tight dialogue and three dimensional characterizations make it soar. He is aided in this effort by a sterling cast, led by the astoundingly good Carla Gugino. Fearlessly diving into the psyche of a high-achieving woman who has left a successful law career to be a full time mother to her son, Gugino is note-perfect, risking being unlikable as she struggles with her own anxieties about the application process, a difficult pregnancy, and the non-normative behavior of her son. In fearlessly getting under the skin of this complicated woman’s nuances, Gugino is absolutely breathtaking. She is lent expert support from Caroline Aaron as the couple’s friend and academic advisor Judy (how insane that pre-schoolers have academic advisors?!) and Peter Grosz as her (mostly) patient husband Greg. We’ve come a long way in getting comfortable talking about kids possibly being gay. We have a long way to go in discussing gender issues. Read Jesse Green’s New York magazine article. (Here’s the link again.) See this play. Let’s keep moving forward. LCT3’s A Kid Like Jake is playing at Lincoln Center Theater’s Claire Tow Theater through July 14. Running time is one hour, 45 minutes, with no intermission. This entry was posted in Theater and tagged A Kid Like Jake, Carla Gugino, Lincoln Center Theater. Bookmark the permalink.